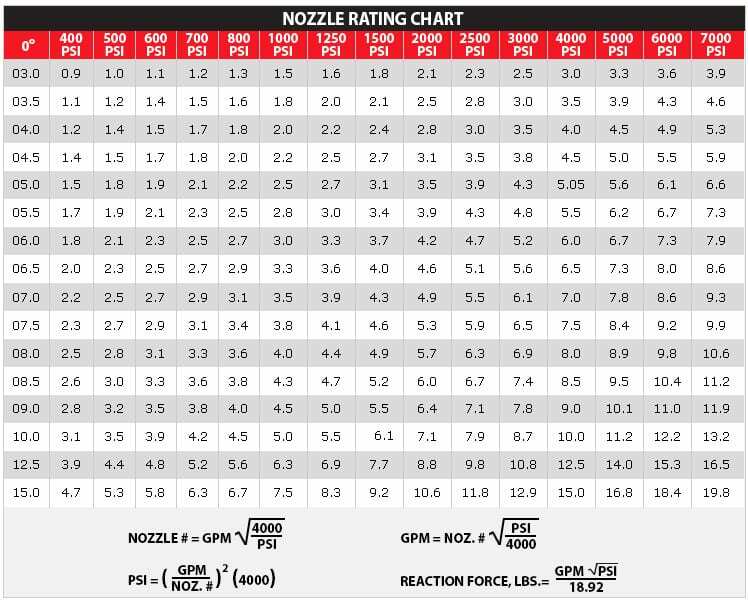 This chart will assist you with the selection of the proper nozzle size. To find the correct nozzle size you need to know the flow of your system and the pressure you wish to achieve. First, select the column with the required pressure across the top, then read down the column to find the amount of flow of your system. Once you find a close match then read down the left-hand column to see the correct nozzle size. If you already know the nozzles that you have, you can find the pressure that can be achieved. Find your nozzle size on the left hand column and then locate the flow of your system. The chart will then indicate the pressure that can be achieved. For more exact information, use the nozzle, flow or pressure selection formulas, which are shown below.